Mario Aerts, directeur sportif in Lotto-Soudal has led Tomasz Marczyński to two Vuelta stage victories and the entire team to their greatest success so far. “Super Mario” is very satisfied with the team’s performance in Spain and surprised that Piotr Wadecki, the coach of the Polish National Team, didn’t call „Maniek” for Worlds. The 72nd edition of La Vuelta was great for Lotto-Soudal. You raced very offensively from the very beginning and, as a result, won four stages. You have to be very happy. Yeah, I`m very happy. It was the most successful Vuelta in our history. We knew before the race that there will be a lot of chances to fight for the wins for the breakaways, so our aim was to be at the front as much as possible. There were three or four chances for the sprinters but, unfortunately, our fastest rider Jens Debsschure crashed out at the beginning of the race. Luckily, a few days later Tomasz Marczyński won the stage and the atmosphere within the team got better. We got rid of stress and pressure. The next challenge for us was to win another stage and, a few days later, Tomasz did it again. At the end of the Vuelta Thomas De Gendt gave us the fourth stage victory. I can’t be happier. La Vuelta 2017 has an impressive number of successful breakaways. Could you explain why it is so from your point of view? Before the race we knew that Chris Froome will be supported by a very strong team, so he was able to take the overall lead early in the race and defend the red jersey to Madrid. This is always good for breakaways. On the other hand, I think that the race lacked a few Spanish stars like Alejandro Valverde and Joaquim Rodriguez. 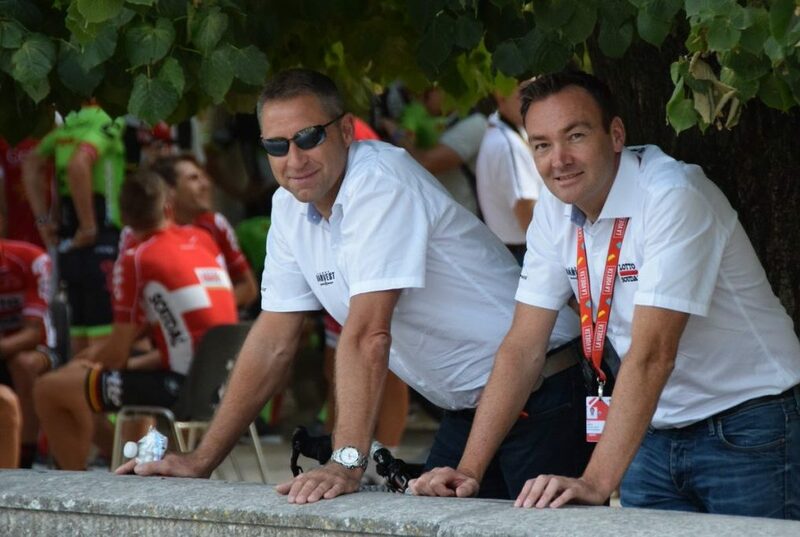 Without them, Movistar and Katusha-Alpecin didn`t have to take responsibility for the peleton. Tomasz Marczyński is in good shape from January, but did you expect two stage victories from him? No. We were almost sure that one stage victory is within his reach, but we didn`t expect two. Achieving two stage victories in the Grand Tour is never easy. Our leader in Classics Tim Wellens wanted to have Tomasz by his side, because he`s very useful to the team in many ways. During the first stages of this year Vuelta he aided Jens Debusschere, too. He`s a valuable rider – he keeps motivating our riders before, during and after the races. Working with him is a pleasure, that`s why I`m so happy he achieved something for himself. I suppose that this was the reason for the renewal of his contract last season in spite of the illness and the lack of shape in 2016. Yes, despite feeling unwell he was very useful to the team, so we decided to give him another chance. He had a solid period of rest and came back in shape as he intended. During the Ardennes Classic Tomasz stayed close to his leaders to the last kilometres and now he had two victories in the Grand Tour. Can we expect that Tomasz will be given a chance to ride on his own in one of the one-day races? In Lotto-Soudal we have a few riders who are fully capable of becoming team leaders in races like La Flèche Wallonne or Liège-Bastogne-Liège. These include: Tim Wellens, Jelle Vanendert and Tiesj Benoot. I don`t think that Tomasz will play the role of a solo leader but definitely he is an option. When I talked to Tomasz during the Vuelta he told me that the renewal of his contract with Lotto-Soudal will be signed within a few weeks. Could you confirm that? I think that he will sign a new contract within two weeks. I don’t know the details, but it won’t be a problem to him. Neither to us. Is Tomasz going to participate in another race this season? Usually La Vuelta is the last race for him, but probably he will take part in Lombardia. This should be his farewell race this season. Tomasz will not be a part of the Polish National Team for this year`s World Championships in Bergen. What are your thoughts on this decision? I really don`t understand it, because he`s in very, very good shape and he proved it even on the Alto de L`Angliru, which is considered one of the most difficult ascents in road cycling. And, most importantly, he is willing to sacrifice himself for the leaders if necessary. I don’t think Poland has another rider who could step into his shoes at the moment. The route of World Championships in Bergen suits him well and if the coach was to take an additional leader, Tomasz would be very useful. I hope this decision will be changed. What are the main objectives for Lotto-Soudal in 2018? We would like to be better in the Classics. But Grand Tours are also important to us. It would be great to repeat our performance from La Vuelta 2017, but it can be very difficult (laugh). In the Classics you were strong, in the finals you were present at the front but you have no wins. What went wrong in your opinion? It`s difficult to explain. That`s cycling and every season is different. Sometimes it seems that everything is OK, but at the same time something might go wrong. We will certainly change something in our preparation programmes, as well as particular riders’ race programmes. But we will be attentively working on this during winter. Poprzedni artykułPierwsza edycja Majka Days przeszła do historii!